It was cold, it was wet, it was muddy – but nothing could dampen the mood of the Pony Club competitors contesting this year’s team showjumping classes. Running for the third year at Rockingham, more than 400 riders from all over the country came to compete at the event which saw people up to the age of 21 show jump courses from 60cm to 90cm in height. Sponsored by Met Zurich, a £500 bursary was up for grabs to the Pony Club branch who gained the most points across the board in all 3 sections. Last year Warwickshire were the successful team, and after the 70cm class they looked in contention for the second year in a row. Despite the inclement weather conditions there was some quality jumping from many riders, especially the Grafton team who rode beautifully, taking them to victory in the 80cm and 90 cm classes. The bursary was theirs. Grafton District Commissioner Sue Binns was delighted with the win and said the money will be invaluable to the club. She said: “It means a hell of a lot to win the bursary. 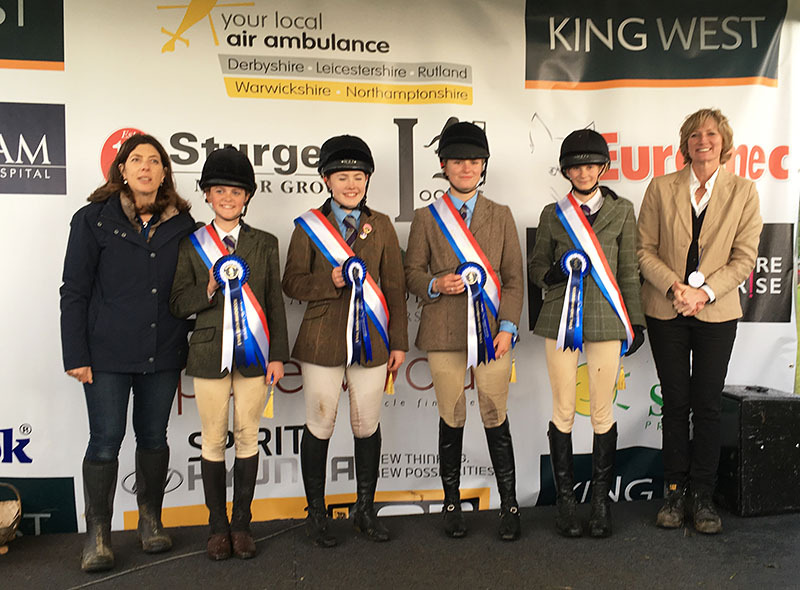 The club has over 180 members including girls Katy Mannix, Lottie Deverall, Ellie Binns and Millie Wilson-Fitzgerald who took first place in the 90cm class. With one of the parents shouting: “Even the weather,” a chuckle of laughter rippled round the team of girls and their parents. Not even the pouring rain could keep the smiles off these faces.